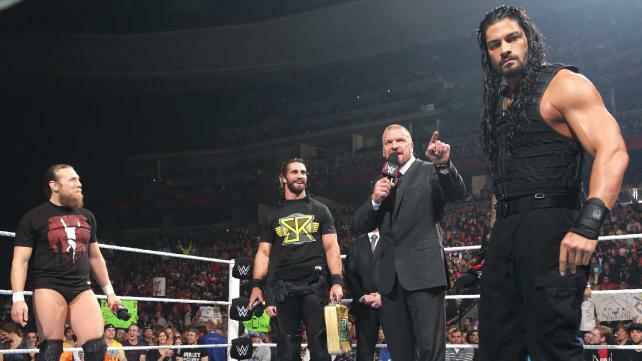 WWE: RAW 2/2/15 Recap!! Controversy Addressed! Let it never be said again that the Authority does not listen to the WWE Universe. Last week, Triple H informed all that at RAW he would make an announcement that would shake the WWE to it’s core and set the controversy of the Royal Rumble straight. In Denver, CO, the COO of the WWE proved he knew what was best for business. It was a night that will be remembered as we continue on to Fastlane and the Road to Wrestlemania! WWE’s power couple begin the evening by coming down to the ring to address the crowd. For two weeks they listened to the WWE Universe’s displeasure over the conclusion of the Royal Rumble match and they were there to make things right. Triple H admitted that Big Show and Kane’s reaction to being eliminated was unsportsmanlike, but that the REAL controversy came from the interference of someone who was no longer a superstar and had no business getting involved. Because of the Rock’s interference, they called into question the legitimacy of Roman Reigns’ victory.The question was asked, and rightfully so, if there had been no interference, would the Powerhouse have won the match? Sure he would go down as the 2015 Royal Rumble Winner, but should he REALLY go on to main event Wrestlemania with Brock Lesnar for the WWE World Heavyweight Title? Before The Authority can answer the question, Roman Reigns decided to storm the ring and the Samoan Superman looked like he was about to explode. He confronted Hunter about what was said about his victory and the two stare each other down. It was only by Stephanie’s cool head and diplomatic skills that calmed the highly volatile situation. Just as things seemed to be settled down, the WWE’s resident farm animal interrupts and stakes his claim on the main event at Wrestlemania as he stated that he never actually lost the title to Lesnar. To which Triple H retorts that Daniel Bryan was stripped of the title due to his inability to fulfill his contractual obligations (he’s a B+ player after all. )At long last, someone with a true legitimate claim to the title, the undisputed, living, breathing embodiment of the Future joined the discussion. Seth Rollins makes the very astute observations that Brock would feast on the Goat and that Roman would not have won the Royal Rumble without the Rock’s intervention. He further stated that if anyone DESERVED to go to Wrestlemania, it was him because he was the one who broke the Champion’s ribs. He attempted to plead his case further, but Reigns cut him off and then threatened him unjustly. The Big Show dominated early as he showed his strength as he taught the Samoan Superman how to fly as he tossed him through the air as if he were a child. The punishment would continue with a big spear that nearly got the World’s Largest Athlete a pinfall. Roman was able to begin to rally, getting a few big clotheslines and a basement drop kick in on the Big Show. But he was quickly shut down as J & J Security (who remain ringside with Seth Rollins <3 ) distracted the referee and allowed Mr. Money in the Bank to use his briefcase on his former business partner. The downed former Shield member then received a huge chokeslam and was pinned by Show. Won’t lie, the only thing that saved this match for me was Seth’s presence in it (I know.. shocker >.>) I just don’t understand the sudden obsession with putting Big Show in matches against Roman. He plods around slowly as if he’s just going through the motions and could care less. He does nothing but act as dead weight no matter WHO he’s in the ring with (and I’m talking about Big Show not Roman you smarky Smarks :p) Roman has improved by leaps and bounds, but we don’t get to see that in his matches against the Big Show. How is Roman truly supposed to cultivate his skills and abilities when he is too busy carrying a washed up giant into relevancy? Thankfully, Seth was ring side to make this match not the snoozefest it was destined to be. And you guys wonder why I call him the Savior of the WWE. Another Royal Rumble controversy to be addressed was by non other than Curtis Axel. He stated that since he was never officially eliminated, that he was the true winner of the Royal Rumble and that he should be the one to go to Wrestlemania to face Brock Lesnar, who I’m sure is now feeling like the Belle of the Ball since everyone wants to dance with him (just sayin). However, this brought out the Lunatic Fringe, Dean Ambrose, and he promptly dumped Axel over the top rope and stated that he had NOW been eliminated. The Unstable one then began to address the crowd. He told the WWE Universe that while at WWE HQ, he had gotten a chance to look at the Wall of Champions and decided he wanted his face on it (he took a great mugshot after all <.<) He figured that since he pinned Intercontinental Champion, Bad News Barrett, he was due a title shot and that he would be focusing his attention on the Brit. At this point, Curtis made the stupid mistake of thinking he could assault the Unstable One and failed miserably as he received a Dirty Deeds for his trouble. Definitely enjoyed this segment. Gotta say though, while it is true that Curtis Axel never was eliminated from the Royal Rumble, he also never technically entered it. Dude never made it to the ring, so he kinda forfeited his spot. Sorry Axe Man, if it meant that much you shoulda sucked it up Buttercup and made your way to the ring after getting that bump on the head from Erick Rowan. No wonder your career is on the rocks… Dean Ambrose going after the Intercontinental Championship is a win. He needs to go after something and since the World Heavy Weight title is so hotly contested, why not the 2nd best prize in the industry? While I would rather see him in the mix with Roman and Seth and Daniel, I understand that that would be a bit much. And this offers him the opportunity to shine against other diverse competitors versus the same guy over and over in gimmick matches that are eventually going to take a toll on his body. In a rematch from SMACKDOWN, Goldust and Stardust took on the dominating team of Konor and Viktor, The Ascension. It was a solid match that saw Stardust pummeled early on, which prompted Goldust to enter the fray without a tag in an attempt to come to the aid of his younger brother. It was only the Attitude Era superstar’s veteran thinking that allowed him to pull his partner into their corner to make the tag. Once in the match, Goldie rallied for a brief moment before he two succumbed to the might that was The Ascension as he received the Fall of Man and lost the match for his team. The end of this match seemed a bit rushed and sloppy. It didn’t flow the way it ought to. But he it’s a valuable win for my beloved Ascension so I’ll let it go this one time. I know my boys are better than this showing, I’ve SEEN them be better than this. I suppose everyone has an off night.Wonder which team is next for my boys to Welcome to the Wasteland? The growing tension between Stardust and Goldust is intriguing. It seems that Cody has lost himself in his alter ego as in a backstage segment when Goldust attempted to break through the rambling by calling him by his name, the younger Rhodes brother demanded that Goldust NEVER call him Cody Again! Definitely has my curiosity peaked. Under the guise of welcoming back the men HE got fired, John Cena monopolized the spotlight once again. Apparently, he took offense to being labeled the past (if the shoe fits John, if the shoe fits.) He stated that Triple H’s WWE would be a WWE without John Cena (yes please) and that he would never give up no matter how much the Authority tried to make him do so. After talking himself up a great deal, Cena then took the time to welcome back Dolph Ziggler, Ryback, and Erick Rowan. But thank the Wrestling Gods in their Squared Circle, Stephanie McMahon rescued the WWE Universe from further enduring more of the 15 time loser’s rhetoric. However, the Show Off took up the mic and asked if she ever got tired of putting obstacles in their way? The female half of the Authority commented on the “Corpus Christi Three’s” desire to fight and made three matches: Dolph Ziggler vs Bray Wyatt, Erick Rowan vs Rusev, and Ryback vs Luke Harper. The last match scheduled for right then and there. Remember folks, the Authority ALWAYS wins. Anyone else notice Cena got off scott free again? Sure he makes a big stink about all he does and blah blah blah, but when it comes down to it, when it’s time to get to work, it is other people who do the dirty work and he takes all the credit for it. Sting comes back and intercedes at Survivor Series, Cena takes credit. Sting is his guardian angel again on Raw, he takes credit for winning the match that got Dolph, Ryback and Erick their jobs back (Seth was about to win, we all know it. I was there, I SAW IT!!) I guess what he means by calling himself the face that runs the place is that he is in a much more managerial roll than down in the trenches so to speak. Def not a guy I’d ever put my faith in. Ryback was ravenous and he fed on the swamp rat gluttonously. But Luke Harper did not make it easy. The two beat each other down and showed no mercy. The two traded offensive momentum on more than one occasion but it was the Big Guy that picked up the win over Harper after a Shell Shock was delivered for the 3 count. Not often does the WWE Universe get to use the term slobber knocker any more, but this match rattled teeth of observers. It was a surprisingly good match, and I say surprisingly because it’s a match that involved Ryback. Luke Harper is always good. the man is deceptively agile and he got to show case his abilities against his opponent. Ryback has been surprising me lately. Before, I couldn’t stand watching him in the ring. It was clumsy and lacked finesse or anything resembling talent. Lately though, he’s been able to put decent matches down and his work just looks better.Yep, I’m giving props to the Big Guy. This match was done very well by both men. It was a bit short for my taste but perhaps less is more in this case. Do I wanna see a rivalry out of it, no not really. But as a singles competition that made both men look good, sure. and that’s what this match accomplished. Even though Harper lost, he did not look weak in the slightest. A quick match that saw Jimmy and Cesaro show off their technical wrestling abilities as they went back and forth in an attempt to wrest offensive control from the other. The offensive momentum eventually went to Cesaro after he tossed Jimmy to the outside, bounced his head off the announce table and then tossed him back into the ring. But the tag team champion seemed to have turned things around after a super kick to Cesaro landed him in the corner. But the distraction from Tyson Kidd on the apron, gave the King of Swing enough time to recover and land a European Uppercut into Jimmy as he was coming down through the air with a big splash. Cesaro picked up the win and Tyson got a cheap shot in with a drive by dropkick. This match was a lot of fun. It is so refreshing to see the Uso’s in a match against someone new. Cesaro and Tyson are a great team and with wins over both Uso’s under their belt, one can only imagine that a title opportunity is on the horizon for the Masters of the WWE Universe. Dolph was a fury of fists at the on set of the bell as he hoped to catch bray off guard and take him out early. The Eater of Worlds, however, would not be so easily destroyed. His ability to take a beating and then return in kind shown through as he quickly shut the Show Off down and reduced him to looking gorgeous (for those of us new to my articles, I happen to think Dolph looks best when knocked out, yes I have extreme issues >.>) Bray used submission holds in conjunction with his vicious hard hitting style kept Ziggler in a constant up hill battle for supremacy. Wyatt showed that he wasn’t all physicality but also an astute student of the game. Every time Dolph began to build momentum, Bray would shut him down. At one time, Dolph was able to explode into a stunning drop kick, and normally that would shift momentum in his favor, But Wyatt rolled out of the ring and left Ziggler literally on the ropes. Nothing could stop Bray Wyatt. The match continued to be hard hitting with Dolph getting in glimmers of offense only to come up short. The match ended as Bray literally bounced up from a Famouser to catch Ziggler in the Sister Abigail. 1, 2, 3 It was over for the Zig Man. Just wow! This match was incredible. Bray Wyatt was a force of nature that would not and could not be stopped. Everything about him was there to make an example of Dolph Ziggler. And the truly scary thing, it was not personal. This was something Bray took great delight in. He was on top of his game and his brutality is second to none. Dolph Ziggler looked amazing as well. He never gave up and gave everything he had. He fought through the pain of being suplexed off the ring apron and nearly decapitated by a clothes line. And it’s no secret I think he has the most beautiful drop kick in the WWE, and this match saw 3 of the beauties (Thank you DZ!!) This match was definitely a contender for best of the night. I’d love to see them square off again, simply because this will be one of those matches that can and will be enjoyed over and over and over again. This was a decent match for Divas competition. Paige and Alicia work well together. The two ladies were evenly matched and went head to head trading blows and offensive maneuvers. Fox did her best to wear down the former Divas Champion with submission holds but Paige battled through and turned the tides in her favor. Paige picked up the with a small-package reversal of Alicia’s tilt-a-whirl backbreaker. But the victory was short lived as Alicia blind sided the Anti Diva and held her for the Bella Twins (who were on commentary.) Nikki and Brie then shammed the pale Diva by spraying her with spray on tan before leaving her in the ring. It was a decent but short match. Nothing too stellar happened other than the match served as a platform for us to care about the Divas title. News flash, as long Nikki Bella holds the Divas title, I’m not gonna care too much about it. There is something about main roster Divas matches that always comes up short in my opinion. Both Alicia and Paige did good, I’m not taking that away from them. But it liked the fire and passion I’ve come to expect in a women’s match. Oh wait… this was a Diva’ match. Women’s is NXT. perhaps that’s why. Just throwing that one out there. Earlier in the evening, the Miz fired Mizdow as his stunt double, but graciously hired him back as his personal assistant. During the match, the A Lister controlled Sin Cara for the majority of the bought. However, the Miz was unable to concentrate on his opponent properly as he had to constantly remind Mizdow that he was NOT a stunt double and to quit mimicking him. This continual distraction actually led to the former tag team champion to get pinned as Sin Cara rolled the Miz up for the pinfall. I love where this is going. Okay the match wasn’t anything that stole the show but provided a huge chapter in the story being told between Miz and Mizdow. Damien looked positively distraught when he was fired and he couldn’t help himself as he attempted to mimic the Miz only to be shut down. Though Miz did have a point. he made Mizdow relevant. He turned Damien Sandow INTO Damien Mizdow. It is no wonder he feels a bit miffed that the ego of his stunt double is getting larger and he is getting the attention. But Damien is about to break out and show Miz that he is a star in his own right. The impending clash between the two is going to be amazing. This was a merciless beat down of the Sheep Mask wearing monster. Rusev hit him hard and kept on going as he over powered his opponent so badly that the Ref would not ring the bell to begin the match. The power of the Bulgarian brute was on full display as he made an example of Erick Rowan. The Super Athlete then ruthlessly locked in the Accolade to further the punishment and act as the exclamation point to what he is capable of and what is in store for John Cena at Fastlane. Short, sweet, and to the point. We got to see Rusev’s power in a way that made him look more than strong. He looked like a monster that could not wait to dismantle the leader of the Cenation. It wasn’t Rowan he was seeing, but the smug face of Mr. Fruity Pebbles. Good on you Rusev. But I have an inkling that Cena got the last laugh. When the Russian flag went to proudly unfurl, it was caught up and did not descend in the majestic way that we the WWE Universe is used to. Instead it was caught up and only half way came down. Cena is immature enough to pull a prank like that. So Cena, I’m looking at you and you sir should be ashamed of yourself! This match was everything fans hoped it would be. The Future of the WWE went head to head with the Beard of the WWE. In what became a clinic of technical wrestling, Daniel Bryan and Seth Rollins gave each other a fight for the ages. The goat faced troll concentrated his attack on Mr. Money in the Bank’s shoulder, in what we knew would be a set up for a coming Yes Lock. The Goat would also show his farm animal colors by constantly using his kicks as an offense in an attempt to wear down the Savior of the WWE. But the Architect would not succumb to the attacks and fired back with brutal strikes of his own. He showed his physical superiority to the resident farm animal with ninja kicks of his own. The two would eventually break into just punching each other in their frustration at being unable to get the other down and out. At one point in the match J & J Security attempted to distract Bryan but were sent back down to the ground for their trouble and Daniel sent Seth to the outside with them. The WWE Universe then got to witness a flying goat as he made a suicide dive onto all three men from the ring. But not to be out done, later in the match, Rollins responded in kind with a suicide dive of his own, and showed DB how it was done! Seth Rollins also showed that he was not to be counted out as he caught Bryan in his attempt at a running knee and countered it into a turn buckle power bomb that he followed up with Avada Kedavra (Super Kick to a kneeling opponent, his finisher in his FCW days) But it was not enough to put the garden gnome down for good as he kicked out at 2. Daniel Bryan showed why you can’t trust farm animals as he suckered Rollins in and locked in the Yes Lock, but Seth proved that he was a true ring general and made it to the ropes to fore the break on the painful move. As The Architect regrouped on the outside, Roman Reigns made his presence felt in a huge way as he took out the Big Show (who was also ringside) with a devastating spear! Roman would further get involved as he delivered an illegal superman punch to Seth while the ref’s back was turned that stunned the future of the company long enough for Daniel Bryan to hit the running knee and pick up the win that would send the Goat faced troll to Fastlane to face the Powerhouse. This match was incredible. Daniel Bryan and Seth Rollins’ chemistry is off the chart. It was a huge treat to see them in the ring together once again (and by one again I mean go check out their ROH stuff, you will thank me profusely). They never disappoint and are always on top of their game. Dainel’s fire and determination makes it difficult not to get behind him and want to see him succeed. there is something about an underdog that you just want to see him come out victorious. But if he wasn’t a B+ player then he wouldn’t be an underdog so double edged sword there. Sorry bout the bad luck that you just aren’t good enough to win on your own Daniel. If it weren’t for Roman Reigns sticking his nose where it didn’t belong Seth would have Curb Stomped Goat boy into oblivion. That being said, Seth was golden, he took everything the Garden Gnome threw at him and would not stay down. The Turn Buckle Powerbomb counter took my breath away esp. when followed up by the Avada Kedavra. It took a Superman punch AND a running knee to put the undisputed, living breathing future of the WWE down. So what’s next for the Savior of the WWE? sky is the limit. He still has the Money in the Bank briefcase, he is still better than anyone else in the company. He has his pick. The world is wide open, besides I’m sure with his superior intellect he will find a way to make Roman pay for his audacity to interfere in something that did not concern him at the time. Seth Rollins is the Architect after all and he’s ot someone you want against you. Otherwise you may find yourself Curb Stomped into the nearest hard surface. This entry was posted on Wednesday, February 4th, 2015 at 1:23 pm	and is filed under Events, News, Television. You can follow any responses to this entry through the RSS 2.0 feed. You can skip to the end and leave a response. Pinging is currently not allowed. « The ‘Magic Mike XXL’ Trailer is Here and it’s Hilarious!